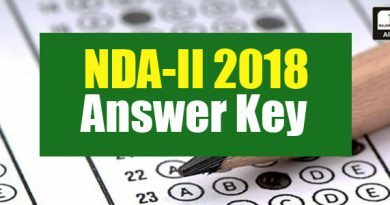 UPSC CDS II Answer Key 2018 will be released via MKC Website for all sets after the examination which is going to be conducted online on 18th November 2018. Union Public Service Commission (UPSC) will be conducted the written examination of Common Defence Service Examination (II), 2018 on 18th November 2018 at 41 different exam centers all over the Country. When the UPSC will release the CDS 2 2018 Answer Key officially, we will update here for candidates help so they will be able to get an idea of how many questions they have done right and wrong. The Combined Defence Services Exam is a national level competitive exam which is conducted two times every year for graduate candidates to get into defense services – Indian Military Academy (IMA), Indian Naval Academy (INA), Air Force Academy (AFA) & Officers’ Training Academy (OTA). Generally, CDS-I exam is conducted in the month of February & CDS-II is conducted in the month of November by UPSC. Candidates who are going to appear in CDS II Exam 2018 examination must be eager to know about their approximate written exam score so that they can start the preparation of SSB Interview as soon as possible because after the announcement of the result time will be very limited and task will be a huge one. Many aspirants after passing graduation or those who are appeared in the same, dream to make a career in defense services and air force, as both are considered as one of the highly reputed services and one can serve his nation. UPSC CDS II Answer Key 2018: Candidates can go through the below-given links just after the examination for the CDS II 2018 Answer key. Candidates who are going to appear in CDS-II 2018 written exam on 18th Nov 2018 will be able to check CDS II 2018 Answer Key here after the release. Note: The official Answer Key of CDS 2 examination will be released on the official website of UPSC. So, candidates you don’t need to worry or need not to wait until UPSC declares official answer key or cut off because it will be done after few months. This examination has got 1/3 negative marking on every wrong answer. Along with the quick release of the Answer Key on the same day as of the official exam, we will also provide videos on our Youtube channel regarding the solution of all the questions which came in the CDS II exam on Sunday. 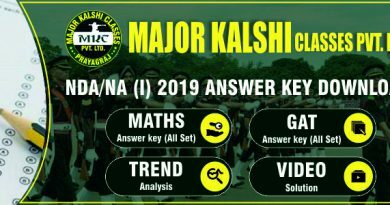 Answer key provided by Major Kalshi Classes is made through extensive amount of hard work which is assimilated by our experienced and highly qualified teachers who collectively discuss pros and cons and then reach on common answer so that no second thoughts should be present after the release. Any queries related to the Answer Keys can be resolved here at this platform via our website and blogs. The answer key shall be available in pdf format. The candidates should download the answer key pdf and cross-check their answers. There will be a negative marking of 0.33 marks. So, while cross-checking, if any answer is incorrect then deduct 1/4th marks assigned to that question. If more than two answers are marks, this will also be considered as incorrect even if one of them happens to be correct. Deduct 0.33 marks in such case. If a question is left blank, no marks will be added or deducted in that case.